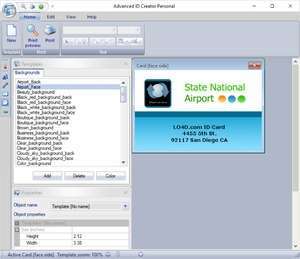 Advanced ID Creator Personal is a bare-bones ID card creation utility that comes with a few odd free templates. The application doesn't necessarily meet the requirements of creating high security ID cards today, but it does provide for a starting point for playing around with creating credit-card or drivers license-sized PVC or plastic cards for printing. The tools provided by Advanced ID Creator Personal are cumbersome and accessing them from the left-side panel of the application is handy but the utility and flexibility leaves something to be desired. The included templates are fine for a freeware application, but it may be better to stick to creating your own backgrounds and layouts with the tools included. Version 10.5.277.2 is a freeware program which does not have restrictions and it's free so it doesn't cost anything. For security reasons, you should also check out the Advanced ID Creator Personal download at LO4D.com which includes virus and malware tests. Additional screenshots of this application download may be available, too.